A mountain instructor climbing up Raise en route towards Helvellyn heard female shouts for help. With very poor visibility and cold conditions he was reluctant to put himself in danger so called for help investigating. Two teams of three including one search dog set out on different paths to cover the area where the shouts were heard. 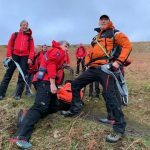 The teams searched the area and main paths from Legburthwaite and Sticks Pass, over Raise and Whiteside to the summit of Helvellyn Lower Man and down to Swirls via Brown Cove Crags. Nothing was heard or seen and the team returned to base presuming false alarm with good intent.